Food for the soul: A good tree is known by its good fruit, a good person is known by the goodness of his thought, words and deeds. Warm greetings to you such good person. Feliz complea�os to Angie Valencia, who has a brilliant mind and is not afraid to make enemies just to make a point, Feb. 2. The same birthday greetings to fashion icon Maxi, Feb. 9; fashion guru and seasoned host Raul Gatal, Feb. 12. Could it be true that there is an Everest Mobile Hotel, este Motel? or Pajero Mobile Motel? You can�t find that in DTI�s list of hotels in Bohol. But this is a juicy scandal. A scandalous, immoral couple (?) has converted the high-ranking official�s service car into a hotel for some years now. Finally, True unimpeachable Very Reliable Source (VRS) has come up with the identity of persons involved in a past blind item in this column. The government-paid driver is bald and married. But since his legal relationship with his wife has gone sour, for over the years, he spends extra-marital escapades in the very car of the high-ranking official. His accomplice? Of course, a woman other than his wife, who has recently born their baby out of extra-marital affair. And, this girl happens to be an adopted daughter of a retired official of a public health office in Bohol. This pertains to the sad stories of my visitors (balikbayans) from Canada whom I personally invited to visit our Province being known as the No. 1 tourist destination in the entire country, yet, all of them went home with unlikeable experiences. The first group of balikbayans composed of three (3) men arrived here in Bohol on January 20, 2008. They already prepared their booking with Cebu pacific and got round-trip tickets dated January 20- January 23, 2008 (Manila-Tagbilaran; Tagbilaran-Manila). On January 23, 2008 two (2) of them were supposed to leave for Manila so I sent them off to Tagbilaran City airport and we arrived there at 1:15 P.M. in which the flight schedule was at 2:00 o�clock P.M. Both of them went directly to the check-in lane and I personally saw them falling in line with other passengers because while I was outside I pepped on the glass mirror. Believing that everything could be alright, I proceeded to island City Mall for some groceries, however after a short while, one of them called me up informing that they couldn�t take the said flight. The plane arrived from Manila at 2:00 o� clock P.M and left for Manila at 2:45 o�clock P.M. The practice of Cebu Pacific is very bad which could adversely affect out tourism industry. Also, on January 22, 2008, another group of my visitors arrived. They were all twenty (20) persons. They stayed at (name of the resort). On the following day, January 23, 2008, they went to a tour and on January 24, 2008 when they were about to check-out, one of them noticed that her ring with diamond stone was lost. She recalled that she left it inside her room no. 116 so they reported the matter to the front desk but the personnel said that they could not call the cleaner assigned on said room because he was off-duty. At 1:30 o� clock in the afternoon of the same day, I personally sent them off to the airport and there they narrated to me what happened so I called up the staff of (name of the resort) with first name Helen, thru my mobile phone, that she was able to talk with the assigned cleaner by phone, in which the latter said that he did not take the ring. Was it proper to simply ask said cleaner thru phone to ask him whether or not he took said ring? The management of (name of the resort) should have conducted a thorough investigation on the matter considering tat it can really affect the tourism industry. Personally, I really felt shame to what my visitors experienced here in Bohol. I even spent my own money just for them to heed my invitation of visiting our Province and let them feel Boholano hospitality and also to personally take a glance of our tourist attractions. With the foregoing, I am fervently hoping that you will take appropriate action on this matter. Don Romulo Gregorio T. Orense, Cebu Pacific communications head clarified things about the airline�s policy. I already spoke to them live on-air. I explained that the 45 minute close counter policy is strictly implemented in all airports by for Cebu Pacific flights. I told them that our terms and conditions printed at the back of the ticket informs the guests that they should have been checked-in 45 minutes prior flight or in-front of the check-in agent. The 45 minutes does not include passengers lining up for check-in or undergoing security check as they enter the airport. So what is true about Cebu Pacific and Lila Mayor Telesforo Balagosa? And what is not true? The Cebu Pacific staff opted to keep mum on the issue until an official statement was issued by their office in Manila. The �silence� was adding more fire for grapevine which is sizzling with hot items such as, the airlines maltreatment of the passengers. The first was the �complaint� of a provincial lawmaker and her husband who were subjects of True blind items issues ago. However, it was found out that it was the couple�s fault. Another complaint was filed by another local town executive. What these officials want to prove? Power or influence? Or simply, they want the �prima donna� treatment? Arriving at the airport 45 minutes before departure time is not synonymous to having checked in 45 minutes before departure time. As simple as that, the mayor of Lila must realize. And the standard is the clock at the airport. Except if he means special treatment for his visitors - visitors of a mayor in this province. Instead of treating it as a negative incident in the tourism industry, it is rather a plus factor to have an airline that is time conscious. It is the pleasure of tourists to take off on time so as to arrive on time in the next destination. The friends of the mayor took the 2pm flight going to Manila. The counter is open for check-in two hours before departure and the counter is closed at 1:15 p.m. On the other hand, a check at the records of Cebu Pacific, the mayor�s visitors actually entered the terminal at 1:28 p.m. and not 1:15 p.m. as the mayor claimed. The mayor also tried to insist that his visitors� arrival be recognized and considered, the fact that there were people who saw them there �in flesh�, smoking. What does the mayor want? Does he want the airline staff to recognize their faces as the visitors of the mayor and take the initiative to approach them and ask them to check in with reminder that the plane is about to take off? Is this the kind of pampering that the mayor wants for his visitors, just because they are tourists? �Mind you, Mr. Mayor, policy applies to all--your visitors and anybody�s. Moreover, it is rather an enduring honor to create and impression and be known as a place of discipline and rules, contrary to the tag that Philippines is almost a lawless land. Similar incidences happened in the past. But have we heard the mayor spread his cloak to come to the rescue for those who were left by flights that observed the schedules to be able to take off on time? Valentine's Day - a holiday just for people in love - is fast approaching! Well, to some extent I still agree with that, but I also think that Valentine's Day is for all and is a great chance to re-focus our lives on the one we love. Five of the most creative answers will be chosen. Send your entries via email: leoudtohan@yahoo.com/leoudtohan@gmail.com. Please have your subject �My Most Unforgettable Love Story.� Deadline of submission is on February 12 at 11p.m. Please include your complete name, address and contact number. 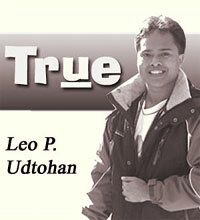 The best love story and the contest winners will be published here on True. The contest is open to Bohol residents only. ICM Screenville Cinema is the most modern cinema outside Metro Manila. It has the first superior Dolby Digital Surround-Ex in Bohol. It has also a relaxing and comfortable fabric seats and state of the art film protection. Mikey Gatal is a true blue fashionista and socialite in the USA. You can check him at www.mikeygatal.com. During my bike trip around Bohol last April, one of my cycling companions was the person shown above, a jovial former rebel leader named Ronald Sendrijas, who told us with pride that he was just the latest in a long line of Boholano dissidents that started with his forefather Francisco Dagohoy (the statue behind Ronald), one of the nation's most illustrious rebels whose real name was also Sendrijas. Our researcher for that trip, Pia Faustino, had found Ronald in the boonies of Bohol and had suggested a ride with him off the beaten track in the rarely visited scenic north of the island. In a way, Ronald was much like many activists I've met through the years - an intellectual with a stubborn streak of idealism. He also had a sweetly melodic singing voice to go with his romantic notions of his homeland. Among his causes was the protection of Bohol's Inabanga River, whose clean water the government had once wanted to pipe to parched Mactan in Cebu province. Boholanos had won that battle and Ronald took me to one of the river's tributaries where we dove in for a cold swim after a hot bike ride. When I met him, he had been recently released after over two years in prison in Cebu for his rebel activities and was adjusting to life above ground in his and Dagohoy's home town of Inabanga. Ronald was campaigning for a relative who was running for local office. He was a controversial figure who had made enemies because of his association with the NPA. But I was surprised that he spoke openly about himself and his causes, and didn't seem much concerned about his security. He was a likeable guy with a perpetual smile, leadership skills and musical talent. He was once a seminarian but left the seminary soon after he started arguing with priests about the existence of God. While visiting the monument above honoring his ancestor, Ronald lamented how the space for activism had narrowed: "Mabuti pa dati, ang mga aktibista kinakasuhan, katulad ko. Ngayon pinapatay nalang." He also remarked on the irony of honoring rebels from long ago with monuments, while the current generation of activists are killed and jailed. Last Thursday, Ronald Sendrijas was assassinated by a gunman on a motorcycle. It was his 35th birthday. His death will add yet another to the list of extra-judicial killings of activists. I hesitate to call these murders mysterious, because the UN special rapporteur Philip Alston and others have already credibly accused the military of this savage form of counterinsurgency. This one is different for me, because Ronald was not just another statistic. He was a very real reminder to me of how much talent and heart are being wasted by a civil war that just won't end. It was a great honor and pride that I was able to attend the Dr. Cecilio Putong National High School (DCPNH) and Holy Name University (HNU) Outreach Photo Exhibit on the life and works of Dr. Cecilio Putong on Feb. 1. I remember that naming Bohol National High School to Dr. Cecilio Putong National High School created �rifts� years ago. There was a board outside the school which read �Dr. Cecilio Putong National High School: Under Protest.� There was a question �Who�s Dr. Cecilio Putong?� There was no picture of him so why named the school after him? Mrs. Concepcion Bagotchay, the principal of DCPNHS welcomed the teachers, students and guests. The life story and works of Dr. Cecilio Putong was discussed briefly by historian Marianito Jose Luspo, the director of Culture Affairs and Development of HNU. It was attended by the first grandson of Dr. Putong, Cecilio Putong III (son of Orlando) and Capt. Zosimo Arbasto, family friend of the Putong. Catch the photo exhibit of the life and works of Dr. Cecilio Putong at the Photographic Museum and Archive of Boholano Life and Culture of HNU. You can call the Office of Culture Affairs and Development at (038) 411-3432, 4113764 and 501-9817 local 114 and 134. THE MAN. Cecilio Kapirig Putong was born on February 1, 1891 in Tagbilaran, Bohol. His parents were Apolinario Putong and Gregoria Kapirig. The father, who was said to have been a band musician, died when Cecilio was still a baby. Two other siblings died very young, leaving Cecilio under the care of his widowed mother and an aging grandfather. Even before he went to school, he already learned how to read and write under the joint tutelage of his mother and grandfather. His first formal teacher was the famous Maestro Andoy, later to serve as Governor of Bohol Fernando Gorraiz Rocha. They got their lessons in the old stone school building that used to stand where the Philippine National Bank is now standing. When the Americans came, he quickly learned the new language. In the American-run school his remarkable intelligence and brilliance were quickly spotted and he was accelerated through the grades. Even as he was still a student in 1904 he was given his first paying job as teacher in Baclayon which compelled him to ride a horse to and from his classes in Tagbilaran. 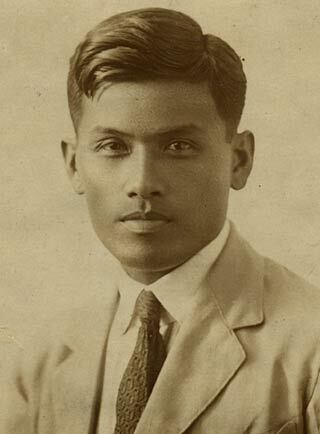 He went to Bohol High School at the start of his secondary schooling but he stayed only a semester because he was made a pensionado (government scholar) and was sent to the Philippine Normal School in Manila where he graduated in 1912 as Valedictorian of his class. He came back to Bohol high School as a teacher in 1916. He married his childhood sweetheart Felicidad Balerong Bautista of Tagbilaran Bohol on May 21, 1922 in Manila. 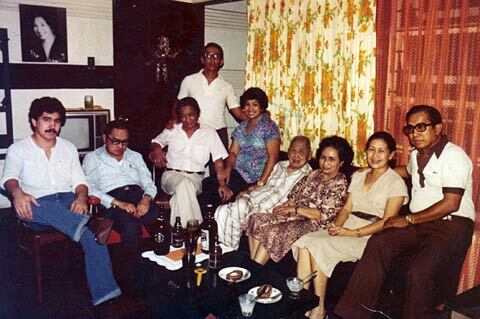 They sired five children: Cecilio Jr., Paul, Orlando, Romeo and Pacita Putong-Sison , the only girl in a brood of 5. She�s the youngest in the family and now the lone survivor of the Putong family. Now retired, she worked a total of 35 years in government service, first as a teacher then connected with the Central Bank of the Philippines serving various high positions until she availed of the agency�s early retirement program. She married Teodoro Montemayor Sison, a lawyer from Pangasinan. The couple has 12 children and 26 grandchildren. THE ACHIEVER. Dr. Cecilio K. Putong was one of the most brilliant man ever produced by the Boholano people. His I.Q. was tested at 138, a rating that meant Very Superior Intelligence, just two notches away from an I.Q. rating of 140 which signified Genius or Near Genius. Was again made a pensionado to the U.S., finishing his BSE degree at the Western Illinois State College in 1920, and his Master�s Degree at Columbia University in 1921. For the third time became government pensionado in the U.S. in 1927 finishing his Ph. D. at the University of Chicago two years later. Email me at leoudtohan@yahoo.com. Or visit www.bohol.ph. your comments on ""Prima donna" treatment and other items"
This article has been viewed 58 times.